In the first segment of this post we showed you how Keith Dube of Dubes Custom Street Machines (Hudson, NH) uses VisualCAD/CAM’s TURN module (VisualTURN) to program the toolpaths needed to turn the front and back of the center caps for the wheels on the 811 Car, a 2016 Callaway SC757 Corvette Z06 promotion by 1-Call Concepts and customized by Paul Jr. Designs. In this segment, we’ll show you how Keith uses VisualCAM’s MILL module (VisualMILL) to complete the center cap machining job. Our third and final segment will show the machining of a custom tool used mount/unmount the center caps and the thread milling of the wheels to match the caps. Keith used the Stock from Selection feature in VisualMILL to setup and mill the logo on the front of the center caps. 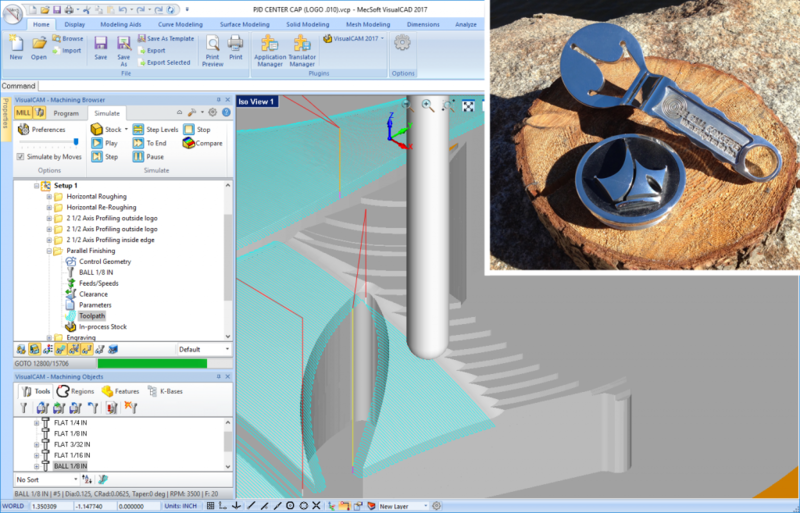 With the stock blank geometry highlighted in VisualCAD, selecting Stock from Selection from the Program tab’s Stock menu, defines the stock based on the selected geometry. Once the stock is defined, the stock geometry layer is turned off and the toolpaths are then created. For the milling toolpath strategies, Keith started with 3 Axis Roughing using a 0.25” dia. end mill and then a Re-Roughing operation with a smaller 0.98” end mill. For detailing, 2½ Axis Profiling and Engraving (0.062” end mill) were used followed by 3 Axis Parallel Finishing (0.125” ball mill at a 5% stepover) to complete the center cap. The sequence of cut material simulations are shown below. The part was then sanded with three different grits and then polished to a chrome finish. Keith also machined a custom tool for easy mount/unmounting of the center caps. Have a look at the images below. 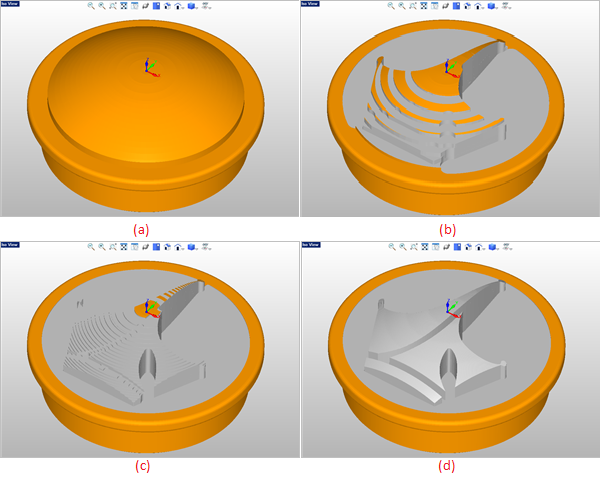 The logo on the center cap is shown in VisualMILL with the 3 Axis Parallel Finishing toolpath being simulated. The Roughing, Profiling and Engraving operations can also be seen in the Machining Job tree on the left. (Inset Top) The completed center cap and custom tool. (Left) The center caps are fresh off the lathe and ready for milling the logo. (Right) The completed center cap and custom tool are ready for sanding and polishing.